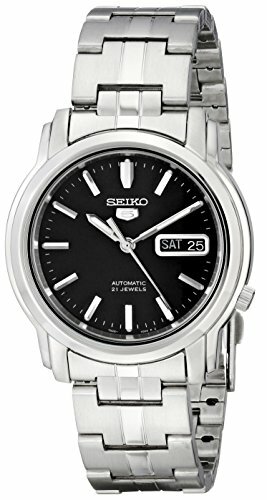 From the master craftsmen at Seiko, the Seiko Men's SNKK71 Seiko 5 Automatic Black Dial Stainless Steel Bracelet Watch is a cutting-edge timepiece with a masculine appeal. Featuring a black analog dial and a silver stainless steel band, this watch is packed with style and would be a great addition to your watch collection. Stainless steel bracelet with fold-over clasp.Water resistant to 30 m (99 ft): In general, withstands splashes or brief immersion in water, but not suitable for swimming.